The International League of Peoples’ Struggle (ILPS) extends solidarity to the consistent resistance by Ms. Irom Chanu Sharmila of Manipur in Northeast India, who has been carrying out fasting since November 2000, as a form of protest to repeal the Armed Forces Special Powers Act 1958. It needs to be reminded that AFSPA has been enforced to suppress the national democratic revolutionary movement in Manipur, other Northeast regions, and Jammu and Kashmir. Under this Act, the Indian troops can search, detain, torture, and kill any one on the grounds of suspicion; leading to the unrestraint violations of human rights with impunity, and widespread reign of terror. Victims, progressive forces across the globe, the UN rights bodies, and commissions instituted by the Government of India, have been demanding the repeal of AFSPA. The Government of India continues to uphold this Act, on the grounds that its army and paramilitary forces cannot operate without it. The ILPS, while extending solidarity to Sharmila’s non-violent resistance against AFSPA, would like to encourage people to make it certain that such individual initiative carries forth the progressive ideological position to organize and resist the overarching trend of capitalist militarization; which has perpetuated the interplaying courses of suppression and exploitation. The individual resistance against AFSPA must have a meaningful place in the larger coordinated course of the struggle for democratic rights. At the same time, any form of individual and organized resistance against AFSPA or State terrorism must do away with individual egoism, opportunist NGO-ism, party partisan politics, and communal sectarianism. A united front based on certain common democratic interests needs to be developed across community or nationality and territorial boundaries. The ILPS further asserts that, like other democratic activists in the world who have been jailed for their political ideology and voice of dissent, Sharmila is a political prisoner. Since 2000, she has been jailed on the false charge of attempting to commit suicide, routinely released and rearrested, and forced fed by the State. To enable her to learn skills that suit her interest and pursue economic activities to ensure that her labor times is fully used, and there are some savings to generate economic livelihood when released. 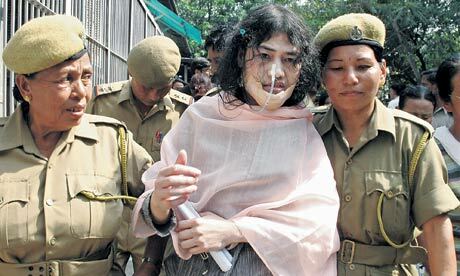 In this regard, the ILPS extends support to the struggle of Sharmila and calls upon the democratic forces around the world to fight for the rights of the political prisoners in Manipur.